"Sometimes the most serious issues produce the best cartoons. 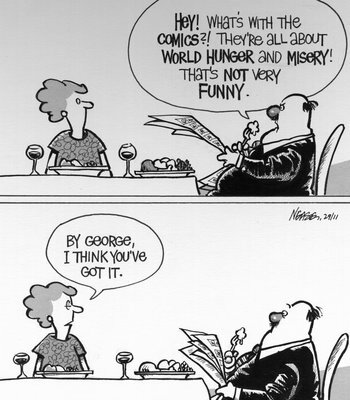 You can take a more serious approach, but [the cartoon] still makes a comment that people can relate to. They appreciate and understand what the cartoonist is trying to say." While many cartoons inspire Oakvillians to identify as constituents in municipal, provincial, and federal landscapes, there are some that go beyond this and poignantly ask us to identify with a larger collective - that of humanity. None do this more so than those commenting on the way we have treated the earth.